I'm thrilled to be sharing a special project here on the blog! 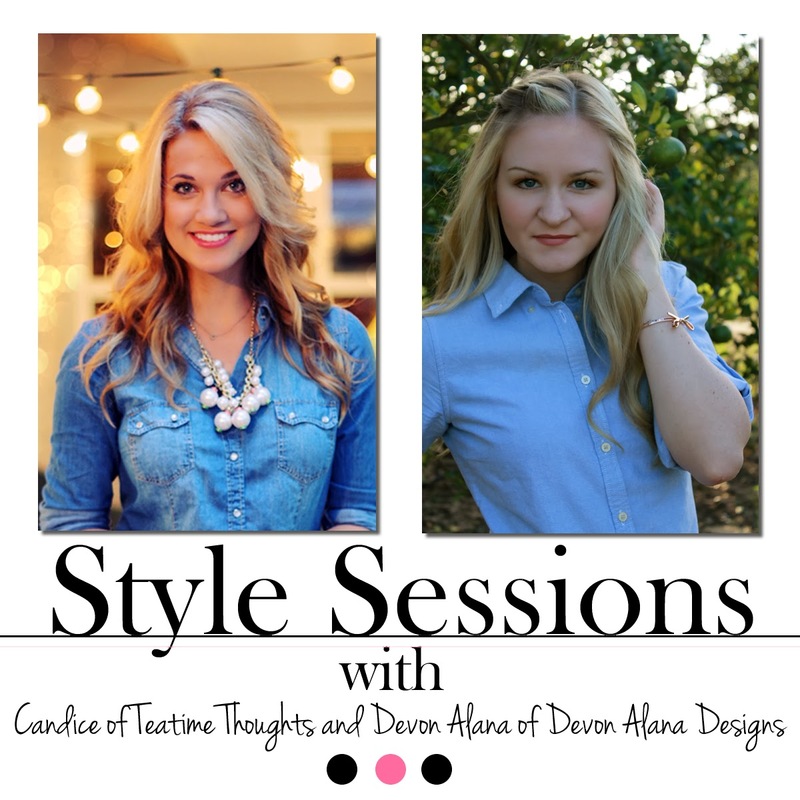 My blog friend- turned real-life friend Devon Alana and I are doing a collaboration called Style Sessions, where we're sharing how to style pieces that every girl has in her closet! We've all, at one point, stood in front of our closets trying to figure out what to wear, and it's easy to fall into a pattern of wearing the same things over & over, or wearing a piece the same way each time, so we've brainstormed a few ideas to help bring some fresh inspiration to your wardrobe! To kickoff the Style Sessions collaboration, we're also giving away a few of our favorite things (Lilly Pulitzer printed accessories, jewelry, nail polish & more!!) to a lucky reader! 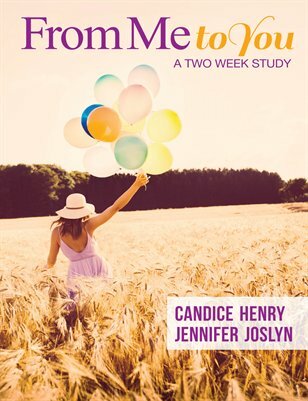 Be sure to enter the giveaway & share with your friends! We hope you enjoy this very special series! Pink is something that's often associated with girly, feminine things, but have you ever realized that it's sometimes tricky to style? I often daydream about all things pretty & pink around this time of year, as Spring flowers and candy hearts adorn many an aisle in stores. While it's often thought to be a childish and sweet shade, I wanted to create a fun, playful kind of vibe with the color...kind of like 'Kate Spade goes to Paris', so I paired it with a polka dot skirt and gold jewelry. To style this top further, I could see it with a great pair of white pants, a topknot and animal printed pumps as a sassy finish. Tres Chic! Some of my favorite things include my Lilly Pulitzer Alexandra top, GAP hot pink skinny jeans, and my pink and brown monogrammed clutch from Etsy! But I pretty much love anything pink! I love fun giveaways! 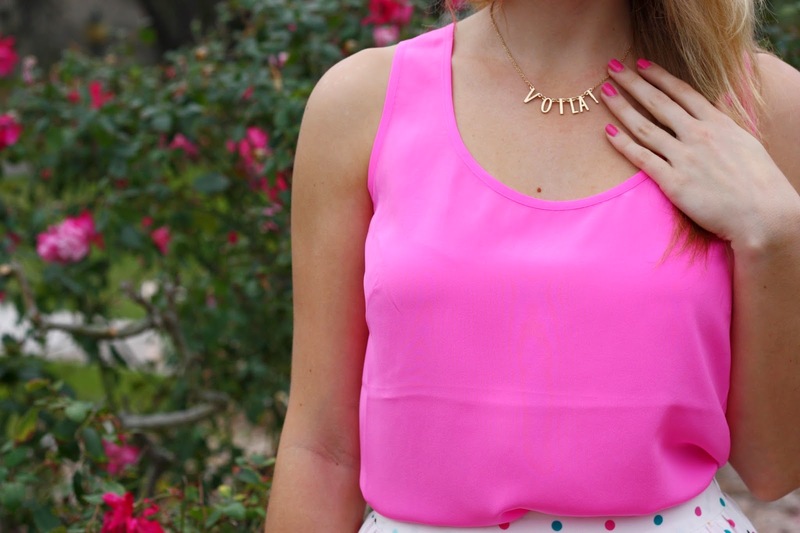 Thanks for the pink styling tips!- Amanda M.
what a great idea! i always find myself wearing the same 'outfits' over and over again. love when i can find new ways to restyle pieces. pink top and polka-dotted skirt can both be found in my closet, but I would have never combined them, now I most certainly will!